You may think that the pattern is the most important first step for making a garment, but the truth is – finding the right fabric is equally important. Even if you think you have the ideal pattern and idea, if you use the wrong kind of fabric to make clothing, you can end up with very disappointing results! 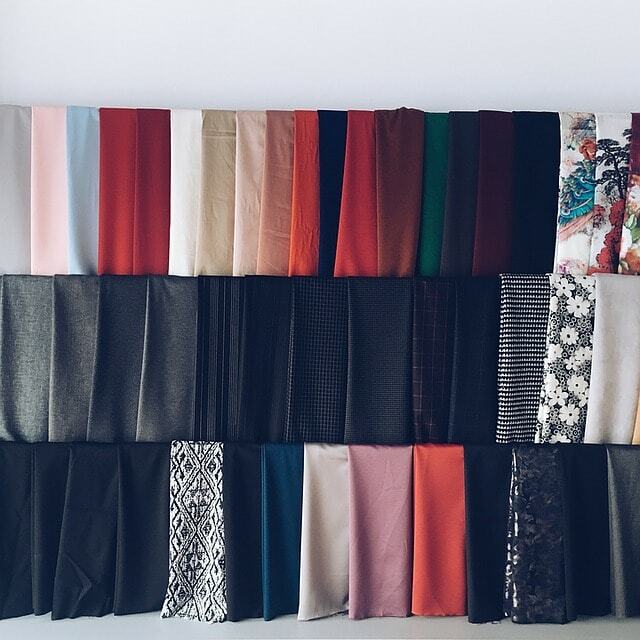 1 So, how do you choose the best fabric for clothes? 2 What are the most common fabrics for making clothes? So, how do you choose the best fabric for clothes? Usually, a new sewing project begins when you completely fall in love with a particular pattern or with a certain fabric. This is natural and is a very good start. If you have a pattern, then you should adhere to the suggested fabrics which should be used for its completion. You can improvise and deviate from these suggestions, but make sure that you pick another fabric with similar texture, stretch, drape, and weight as the one suggested. It is essential to keep in mind the features of the fabric for a specific project, especially how the fabric behaves during the sewing of the garment and afterwards, as well as how well it drapes around the body. What are the most common fabrics for making clothes? This is a semi-sheer and very lightweight fabric which has a great drape. It is similar to the cotton voile but it has a crisper feel to it. This is another lightweight fabric which is very smooth and drapes well. It is a tad heavier than other fabrics from the lightweight category such as the cotton lawn and cotton voile. This is yet another light fabric which is very smooth. Keep in mind that it doesn’t drape quite as well as the previous three types of lightweight fabrics in this list. You are probably aware that denim is one of the most popular fabrics used for making all types of clothing already. It is a heavyweight fabric which doesn’t stretch or drape too much. It is made of two gauze layers which are woven together. This resolves the problem with the sheerness of standard gauze. At the same time, double gauze still has all the positive qualities of gauze including the extreme lightness and airiness. There are various fabrics which fall into the knit category – in both the lightweight and medium weight category. Knit fabrics are perfect for patterns which require stretchy fabrics. If your pattern suggests you use a knit fabric, make sure you check the amount of stretch requires, so that you can choose the right fabric for the project. Silk is a luxurious and delicate fabric which can be quite difficult to work with due to its delicate structure and its slippery texture. Plus, it is quite more expensive than many other fabrics, so use it wisely. Silk is perfect for making linen. It too is glossy and smooth like silk but can vary in type – from lightweight to heavyweight. This is a medium weight fabric which has very little elasticity and is perfect for warm weather clothes because it conducts heat pretty well. There are more than 200 types of wool, which come from different sheep breeds. It is great for making warm clothes and is one of the most versatile and durable fabrics which you can use for garment making. This is a lightweight and soft fabric which is great for sewing shirts, jackets, and pants for colder weather. But what if you already have the perfect pattern and you want to find the most appropriate matching fabric for it? Here are some rules of the thumb which will help you pick the appropriate type of fabric for the different types of garments. The best fabrics for sewing pants should not be too rigid or hard and should be comfortable to wear. Some of these fabrics are wool, tweed, denim, wool crepe or flannel. If you are making summer pants – go for linen! Pick rayon challis, cotton voile, knit, double gauze, cotton lawn, satin, chiffon, chambray linen or flannel to make that perfect shirt or blouse. The fabrics which are most suitable for sewing skirts are denim, cotton lawn, knit, rayon challis, silk jersey, and linen. You can also use soft wool, rayon or velvet for making a beautiful skirt. Cotton lawn, cotton voile, rayon challis, lace, chiffon, velvet, Organza, taffeta, knit, double gauze, satin, silk, wool, and linen are all great fabrics for making a dress. All cotton fabrics are great for kids. You may want to choose a cotton lawn, satin, or satin stretch to make adorable clothing for kids. Wool knits also are excellent for children. Stay away from synthetics when you are making a garment for a young child. Look for fabrics with a balanced proportion between the vertical warp yarn and the horizontal weft yarn. This balance is essential for the quality of the fabric. Also, check out the thread count of the fabric you have picked to ensure that it is sufficient for the specific pattern you have. Consider whether you will need a fabric which is single strand woven or twisted. The latter are stronger and durable and thus superior to the single ply yarns. Also, make sure you check whether or not the fabric has finishing of some kind. The finishing process does improve the performance and the appearance of the fabric. Check the fabric for any uneven colors, spots or streaks. If you see lighter colored lines where the textile is folded, then it is pretty likely that the color will actually fade with washing. You can always tub a tiny spot on the fabric with a damp piece of cotton or a handkerchief if you see color transferring from it – then the fabric is definitely not colorfast. If you are not sure whether the fabric will shrink after washing, it is a good idea to buy about 10% extra. Of course, if you can – choose a preshrunk fabric for your clothing sewing project.